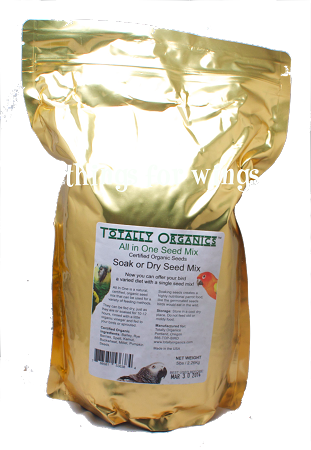 ALL-in-ONE Soak mix –Soaked seeds are like the germinated seeds parrots would eat when living in nature. Dried seeds contain all the nutrients necessary for a plant to live and grow. When soaked, this nutrition is awakened and provides a parrot food, which as like feeding fresh food. Therefore it is a great source of nutrition for your parrots. Seeds and grain in this form make the nutrition more available and are also easier to digest. We feed our parrots some seeds every day some day dry, some day soaked. It gives them a variety in one seed mix. Soaking AIO is an easy process. Just put one part AIO seed mix in about three parts of room temperature water and let soak for between 8 and 24 hours. Drain, rinse with some water and its ready to feed. If you want, you can add some apple cider vinegar or a drop of GSE and rinse again with fresh water before feeding. If some is left over, you can keep it in the fridge for a few days. It will start sprouting. We suggest that you rinse again before feeding.